The lean, green,muscle machine is Marvel icon and while she may not admit it she is one of the Avengers greats. I'll start us off. Were she to have been in a JLU-style Avengers show continuing from the MAU, I would've cast a voice actress that would've been a good balance between Lisa Zane's sultry take and Cree Summer's spunky take from the 90's Incredible Hulk cartoon, with an ounce of professionalism in her manner: Jennifer Martin. I was inspired by her turn as Agent L in the Men In Black cartoon--she'd have the chops for voicing She-Hulk. Needs more scans, but nice. She-Hulk is awesome i wish they give her more pannels and also give her another book. I don't think it's stretching it that She-Hulk could daze classic Thor with a sucker punch. It's not like She-Hulk can't hurt Thor level beings, because she can. woul win is major PIS though. Hmmmm You're probably right. Where She-Hulk has been pretty consistant in terms of strength Thor has been beefed up more through his history. Back then this was much more plausible. Also Thor doesn't have his hammer here. Ps. Post some scans Vance help me out here! I actually don't like posting scans in respect threads because it gives away my ammo in battle forums and causes people who have never read a She-Hulk comic to feel like they know what they're talking about.I will however see what I can do since you asked for my help. @Vance Astro: Thanks Vance and I'll remember your no scan rule in the future. I don't know what the point was in giving her that strength level-up in volume 3 and then removing it (or just ignoring it) in volume 4. Anyone have scans of her fight with Iron Man when she discovers that the Illuminati sent Hulk into space? She did much better than I expected. Edit: Oh, it's up there. Only one scan though. I have a few feats from older volumes. There's a bunch of other stuff, but I don't have the time to root them all out right now. @CitizenBane: Thanks for contributing. Yeah I only put up part of that fight if you have the rest please post it. Awesome scans, man she-hulk needs to be used more. Do you mean when She-Hulk was strong enough to lift the Thing's best with one hand? @Vance Astro: Yeah, and later when she let Hercules win an arm-wrestling match so as not to bruise his ego, implying that she had strength nearing his level or something like that. She had a team-up with Hercules in the next volume when they fought this Celtic god (forgot his name) and Herc casually threw her off him. If i'm not mistaken, She-Hulk gained that extra strength by weight training and gaining muscle mass before fighting the Champion.After her fight with Titania (when she had the power gem) it appeared that Jen was stronger than she had been before but in a calm state wasn't as strong as she was for that short period of time.I don't recall if there was an explanation for it though. @Vance Astro: Yeah, Pug told her that her strength grew exponentially, so she built up some muscle as Jen Walters to increase her strength as She-Hulk. After that she was strong enough to one-shot Titania (the issue right before she got the Power Gem). All of that was in a calm state though. She was given that Jupiter suit because she couldn't contain all her strength. You think it's possible we are missing an important detail, or Marvel just didn't care to give an explanation? I think whoever wrote the next volume just forgot or something, because after that no reference was made to her strength increase and her feats didn't improve anyway. her feats didn't improve anyway. I don't know if the issue is so much that her feats didn't improve as much as it is the fact she didn't have many feats at all prior to that. I think it was kinda silly that Marvel thought Red Hulk was worthy of facing these superheroine powerhouses, but the team is freakin awesome. The Lady Liberators need their own book. Lady Liberators should get their own book...DC has Bird of Prey, why can't Marvel have their own all female team? Because Marvel has little to no interest in promoting their female characters. 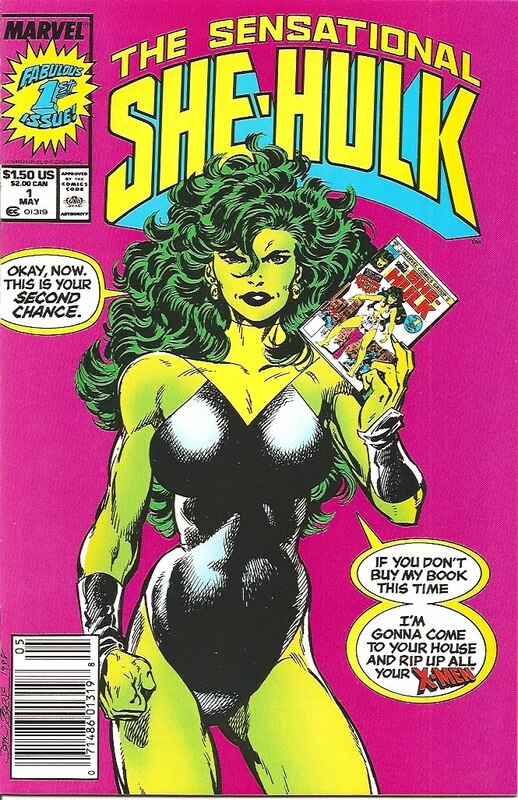 I would love a She-Hulk movie so much. This forum is so dead. Shows that no one likes she hulk. She has a new feats and no one is posting it.